“The King of High Adventure.” Starlog. In a world of magic and gunpowder, the half-breed Rik must rise from simple soldier to the deadliest assassin the world has ever known. In Death’s Angels, Rik and his fellow soldiers of the Seventh Infantry uncover a sinister conspiracy to waken an ancient slumbering evil. They encounter the lovely and terrible Lady Asea, immortal sorceress and ultimate manipulator of men and nations. Their deadly quest will eventually take them to the haunted city of the cannibalistic Spider God to face the hidden peril lurking there. 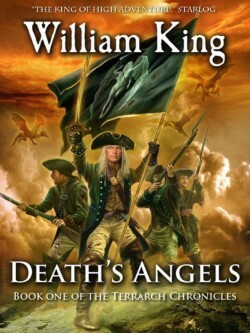 Death’s Angels is a thrilling tale of muskets and magic blending Lovecraftian horror with adventure in the tradition of Sharpe by the bestselling creator of Gotrek and Felix and the author of Illidan.